We rent huge Inflatable water slides for summer parties and events. 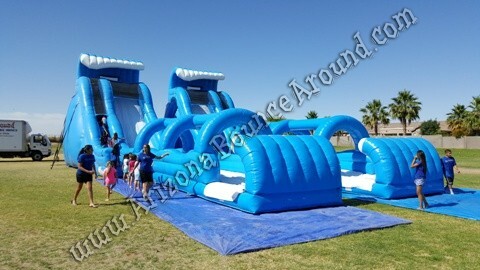 This dual lane, dual climb, dual slip n slide Inflatable Water Slide is 24' tall and almost 80 feet long and rents for only $1198.00 for 4 hours. It features 2 matching 24' water slides but with the stairs on the outside of each one to keep the lines moving and eliminate the big muddy mess created with a single climb water slide. Our super fast slide surfaces will have you flying down the attached slip & slides and is ideal for kids 5 to Adult. Our masive dual lane 24' water slides will add the WOW factor to any summer or water day party and have white slide liners to keep the slide cool during use. What will your guest think when they arrive and the dual lane slide is taller than the building? This dual lane, dual climb water slide is very popular for schools, churches, city or large events and can handle crowds of any size. We also rent this water slide in a single lane version for less output with the same wow factor. This dual lane water slide features easy to climb steps, a super fast sliding surface and big slip & slide runway. This 24' dual lane water slide is super fun and offered exclusively by Gravity Play Events. This dual lane 24' water slide comes complete with a hose and nozzle at the top to keep it cool and slippery and a spray hose above the slip & slide attachment. All we need from you is a standard water hose in good condition to reach the slide and 4 regular electrical outlets on separate breakers or rent a generator from us and you can have a super water slide party to remember. Rent a dunk tank or water games for a complete summer party. This dual lane water slide rental requires 4-6 adults to operate and is not a fully automatic slide. One at the top of each slide spraying water, one at the base of each stair case controlling traffic and one on each slip & slide making sure the slide surface is clear before the next slider goes. Call us today to reserve your next water slide party 719-531-7510. Scroll down for even more actual photos of this 24' dual lane water slide in action, no clip art here. Add a dunk tank for even more fun.